Dopo aver svelato ed apprezzato le prime due Anteprime delle Campagne Pubblicitarie di Gucci e Louis Vuitton per l'Autunno/Inverno 2011-12, adesso è arrivato il momento del Brand inglese: Mulberry. Le fotografie sono state scattate da Tim Walker e racchiuse in un'atmosfera molto particolare, colori freddi ed elementi simbolo dell'inverno come rami e foglie ma sdrammatizzate dalle gigantografie di vari tipi di uccelli che riescono a dar colore ed un tono acceso e prorompente alle foto. 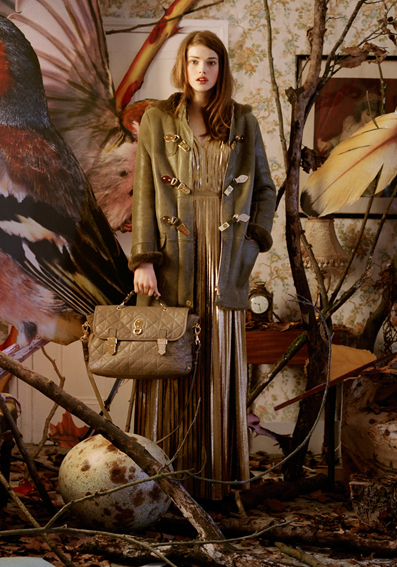 After having revealed and appreciated the first two previews of Advertising Campaigns for Gucci and Louis Vuitton Fall/Winter 2011-12, now is the time of British Brand: Mulberry. The pictures were taken by Tim Walker and sealed in a particular atmosphere, cool colors and symbolic Winter elements such as branches and leaves but played down by giant-posters of various types of birds that can give color and tone to these amazing pictures. Nulla da ridire sulla collezione che trovo estremamente elgante, raffinata e totalmente in perfetto stile "Inglese". La foto più bella è la prima, adoro questo gioco di colori tra la modella e lo sfondo. Qual è invece la vostra preferita? Nothing to complain about the collection that I find extremely polished, refined and totally in perfect "English" style. The best photois the first one, I really love this game of color between the model and the background. Which is your favorite one? what a beautiful campaign! love it ...! so reminds me of mcqueen..
a me piace molto la seconda. Adoro questo genere di campagne fotografiche! I always love the mulberry ads!! thanks about your comment on my blog!! i follo you!! of course!! yes you follow me for missmake-up.tk I follow you are fine! Fabulous. I really like Mulberry and she is spectacular.. a future top-model! Love your blog, dear. Of course I want us to follow each other. Now follwing you, hope you'll do the same. l'ultima foto!quell'abito è meraviglioso!niente male anche i cappottini e le borse..perfetto stile inglese come hai ben detto! 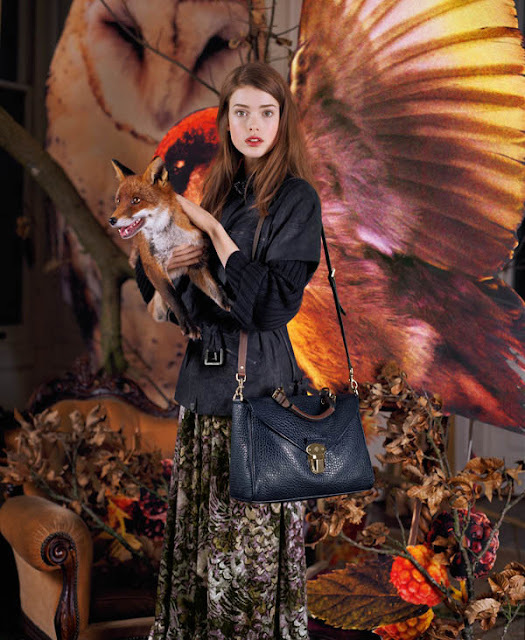 mulberry campaigns are always awesome, no wonder they managed to compile a book! i love how they're offering a quilted option this year too! anyways following your blog now, hope you'd drop by mine and follow me too. il secondo cappotto è stupendo! 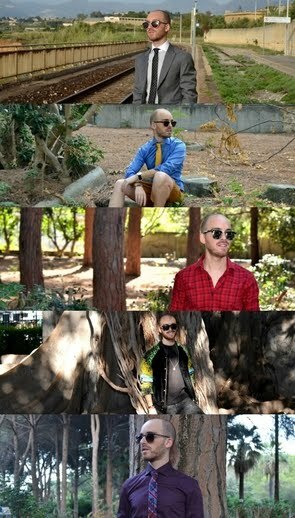 I can´t choose just one pic, i love the three!Mulberry is awesome!! julia saner is one of my favourite models at the moment-so pretty! Che bellezza...le borse sono stupende! I too like the first one. Cute expression plus very nice jacket (little trench?) and bag! I LOVE the outfit in the second photo - so classy! I love your blog and I was wondering if you would be interested in following each others blogs? Hey! Loved the preview. The first picture is just dreamy! Beautiful photos, so amazingly poetical and spiritual... I adore them ! La seconda é quella che mi piace di piú. Julia Saner is such a beaut but I thought these photos were kinda meh. 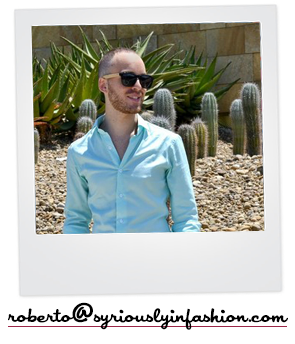 Complimenti bel blog :) ti seguo!! splendido servizio fotografico e che outfits!!! Oh! These are truly amazing! My favorite picture numer one. I love the expression. Such cool pictures! The bags are so pretty too! ohhhhh i love the second picture! beautiful outfits! Curious take on outside wants in. I love the outerwear here! Yeah, fist photo is my favorite as well. I'm not big fan of others, because it seems they are missing of sharpness&contrast. I like central idea, but I have kind a feeling that it isn't work down. superbe sélection de photos, j'adore. I am so in love with the second coat!! I like this campaign! Pictures are not boring. Beautiful decorations and true harmony between clothes and interior. Merci de ta visite sur mon blog ! Je découvre le tien que j'apprécie. Très belle sélection de photos !